Flat companion. Flat gaming is popular. 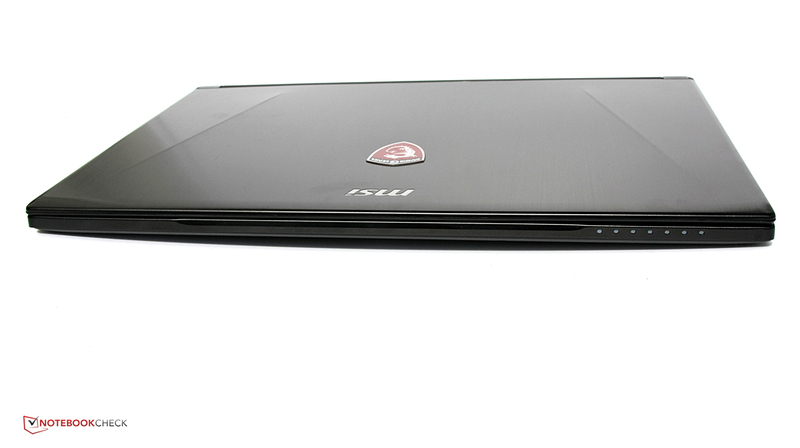 No, we don't mean 2D games, but thin gaming notebooks like the MSI GS60. The 15.6-inch device is supposed to provide excellent mobility with a height of almost 2 centimeters and powerful hardware. Our review shows you why this is going to be a hot ride. A ghost is something you rarely see, except if you work at an old firehouse in New York with Ghostbusters written on it. MSI wants to change that and offers a ghost for gamers, or at least a notebook with Ghost in the designation: The GS60 Ghost is a 15.6-inch notebook with a height of less than 2 centimeters (~0.8 inches), but it accommodates powerful hardware. The designated target group is therefore gamers who do not want to carry their gaming PCs to every LAN party. The GS60 Ghost is also well suited for practice on the way to the next e-sports event. Or you may just want to ride a train and enjoy your games in good quality without carrying a 5 kg (~11 lbs) monster. A thin, light, but still powerful gaming notebook seems to be an interesting niche, which gets more and more products lately: The Alienware 14 is at least smaller and lighter than its bulky siblings. The Razer Blade 14 initiated the trend towards thin gaming laptops, but it is hard to get in Germany. Gigabyte's P34G is the price cutter amongst thin gaming devices and a very sophisticated product overall. Maybe normal 15.6-inch gaming notebooks, with their larger cases, are better solutions? We use the One K56-4N, MSI GE60 and MSI GT60 for a comparison. 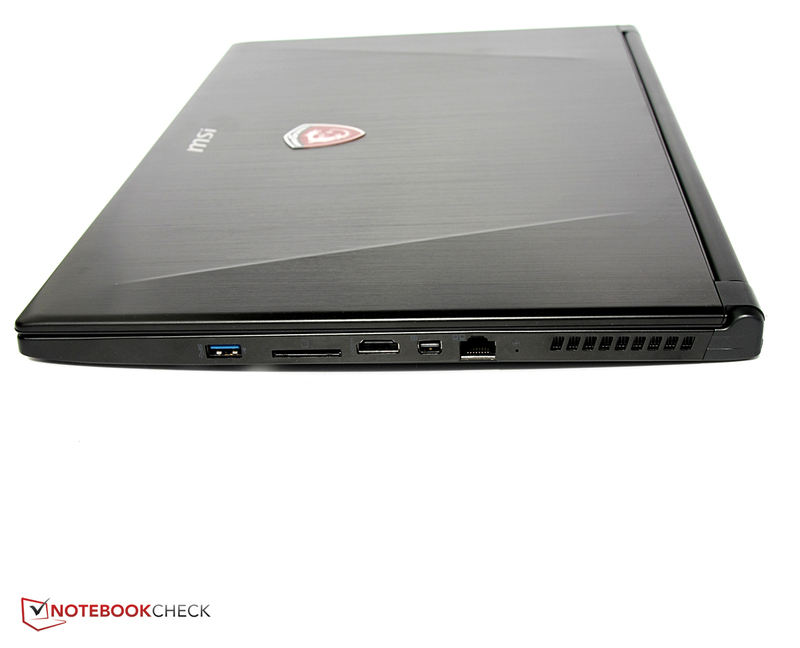 Our review unit is the MSI GS60 2PE Ghost Pro 3K Edition with an Intel Core i7-4700HQ and an Nvidia GeForce GTX 870M. You also get a very high display resolution of 2880x1620 pixels, which is also the reason for the 3K in the designation. 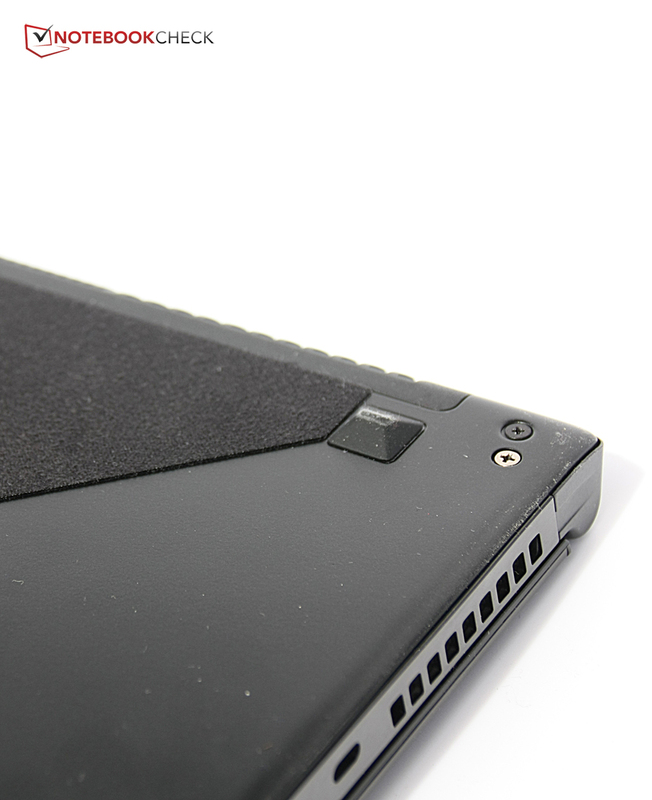 The hardware is definitely superior to other thin gaming notebooks. But what about the cooling? And the system noise? There were issues with the larger MSI GS70, let's find out if MSI was able to solve them in the case of the GS60. We reviewed the MSI GS70 almost nine months ago and really liked the matte chassis with many aluminum elements and the stylish design. 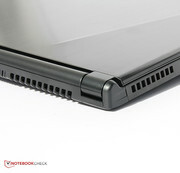 MSI uses this design language for the GS60 as well: The bottom of the chassis is once again made of matte and brushed metal, but the metal of the palm rest is too susceptible to fingerprints. A bolder design decision is the lowered keyboard, which is actually identical to the GS70: The lettering is futuristic, angular but still easy to read. Above the keyboard is a wide speaker stripe, and above that the round and illuminated power button in the center. 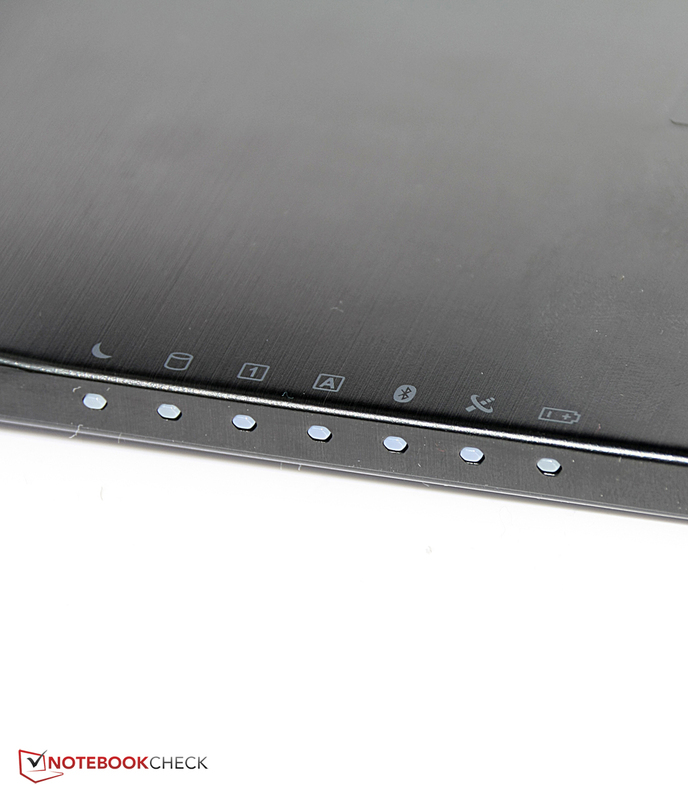 Numerous blue status LEDs at the left front of the notebook indicate the Bluetooth and WLAN status, whether the battery is charging and if the hard drive is working. 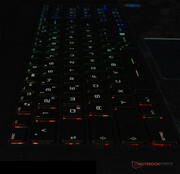 The illumination itself is a great spectacle because the keyboard backlight is adjustable in multiple colors and multiple areas, just like Alienware notebooks. The dimensions are very slim for a 15.6-inch gaming notebook, just 19.9 millimeters (~0.78 inches). It is not even half as thick as the MSI GT60, whereas the width and the depth of the two devices are almost identical. Only the Razer Blade is superior in terms of height within this comparison: It is just 17 millimeters (~0.67 in) thin. The weight is comparatively low, as it does not even weigh 2 kilograms (~4.4 pounds). The power adapter is around 650 grams (~1.4 pounds). The GT60 weighs almost 3.3 kilograms (~7.3 pounds) plus 900 grams (~2 pounds) for the power adaptor. 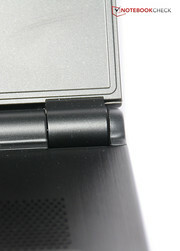 The display is very thin as well and is solidly kept in position by two very small hinges on the left and right side. You can open it up to 160 degrees, which should be sufficient for almost every situation. The construction of the display is pretty thin and light, but also very flexible: You can twist the display and the frame creates creaking sounds in the process. Pressure on the back is no problem and there are no picture distortions. The lower part of the notebook is very sturdy, cannot be twisted and just occasionally creates very quiet creaking sounds. The very compact construction, which is necessary to enable the thin chassis, makes the maintenance harder compared to other gaming laptops. Some devices even come with descriptions about the replacement of components in the manual, but this is not the case for our review unit. 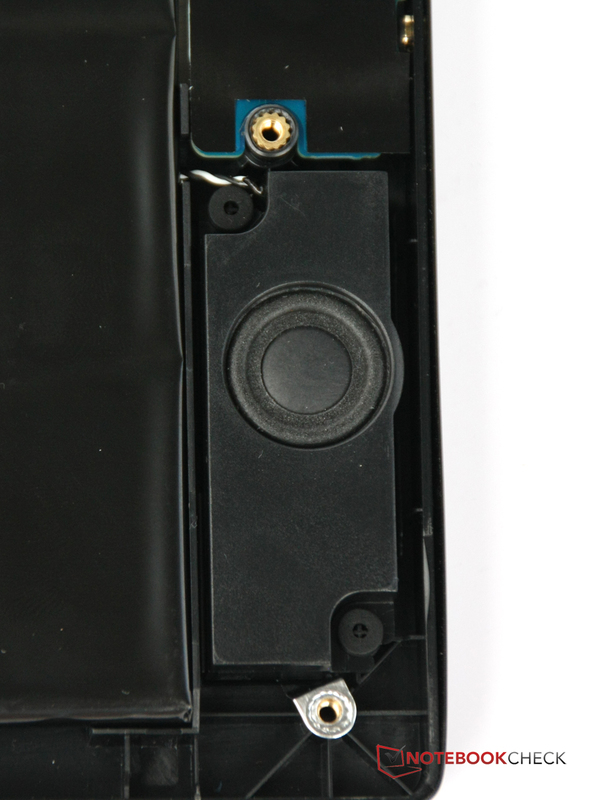 You can remove the screwed bottom cover and get easy access to the hard drive and the fans, but other components like the RAM or the battery are still hidden and you have to remove several cables and other components to get to them. 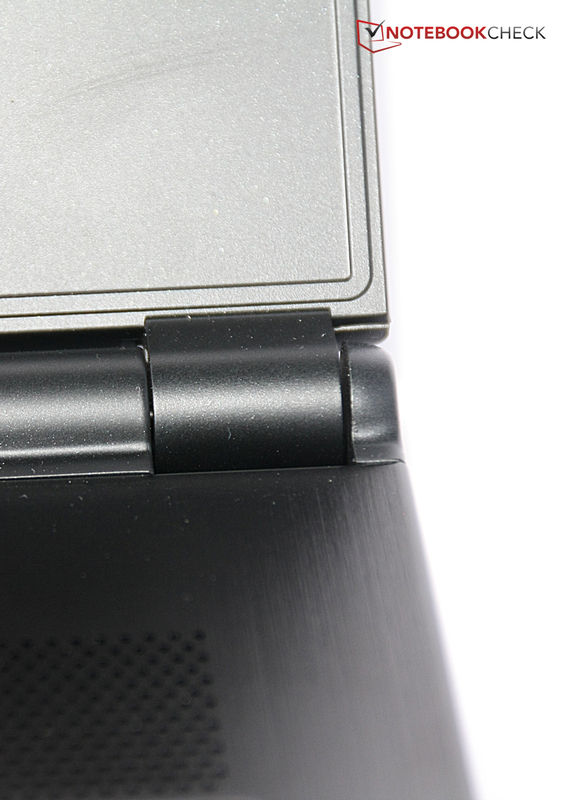 Because of the complex cooling solution at the back, the ports are located further toward the front of the sides. While there are only fan exhausts at the back, there are also fan grilles at the rear of the sides. There are no ports at the front. As a result, the power connector on the left side is very far toward the front as well, which can be annoying for left-handers when they use a mouse. The same applies to the USB ports at both sides, which can also affect the handling of a mouse. At least the video ports on the right side are placed so that you can route the cables towards the back. All in all this is probably the best port layout when you consider the circumstances. The MSI GS60 does not waive a full-size Ethernet port despite the slim silhouette. MSI also integrates a Killer-2200 network card, which is supposed to recognize data packages from games and favor them to ensure stable online gaming. We could not determine a much better signal or a lower latency compared to an Alienware M17x R4 with the Atheros AR8151, but all connections were stable and fast. 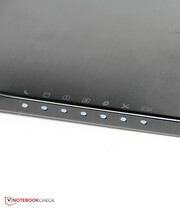 Wireless connections are handled by the Intel Wireless-AC 7260 that supports the latest standard 802.11 ac with very high transfer rates when you use a corresponding router. According to the Windows indicator, the signal quality is very good: We still had the full signal with a distance of ten meters (~33 feet) and through three walls. Another two meters (+6.6 feet) and one wall still resulted in 4/5 bars. The connection was only lost if we left the house. Otherwise, web pages loaded very quickly. Besides the power adaptor, a quick start guide and some brochures, there are no accessories in the box. MSI does not offer special accessories in its online shop, either. 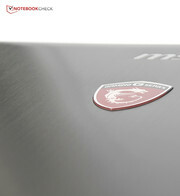 MSI grants a manufacturer's warranty of 24 months for the notebook. You will have to send the device to MSI. 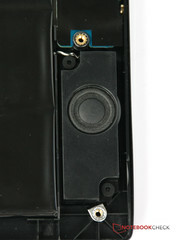 However, some parts like the battery are only covered for one year. You can extend the warranty period by another year for 139 Euros (~$188). 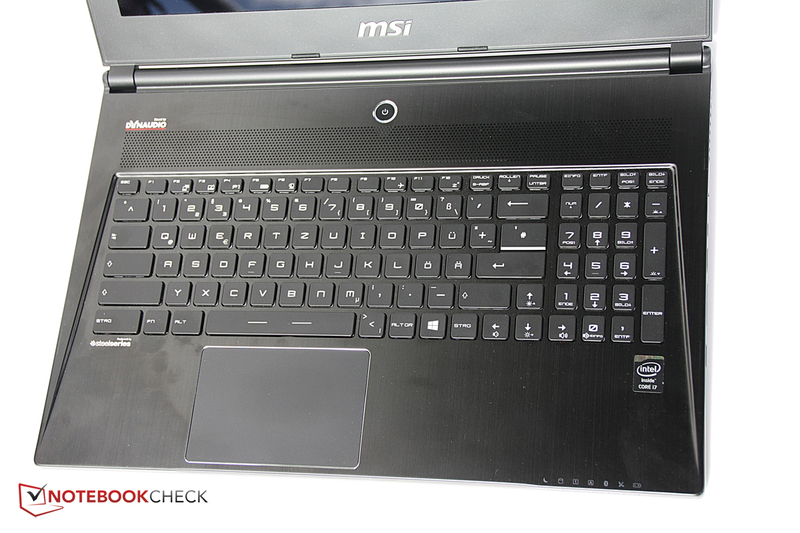 We already mentioned that the keyboard does not really differ from the version of the MSI GS70 gaming notebook. This means neither the advantages nor the disadvantages have changed: The layout with a very wide Ctrl key, Windows button on the right side and the half-sized Return key take time getting used to and are also not always perfect for gamers. The same applies for the lettering, but it looks very futuristic in return. We do like the soft stroke of the keys, so even longer texts are no problem. Travel is short, the pressure point well defined and the keys have grip, all of which are positive features for gamers. The optimization for multiple strokes is another positive aspect that can handle multiple inputs at the same time. 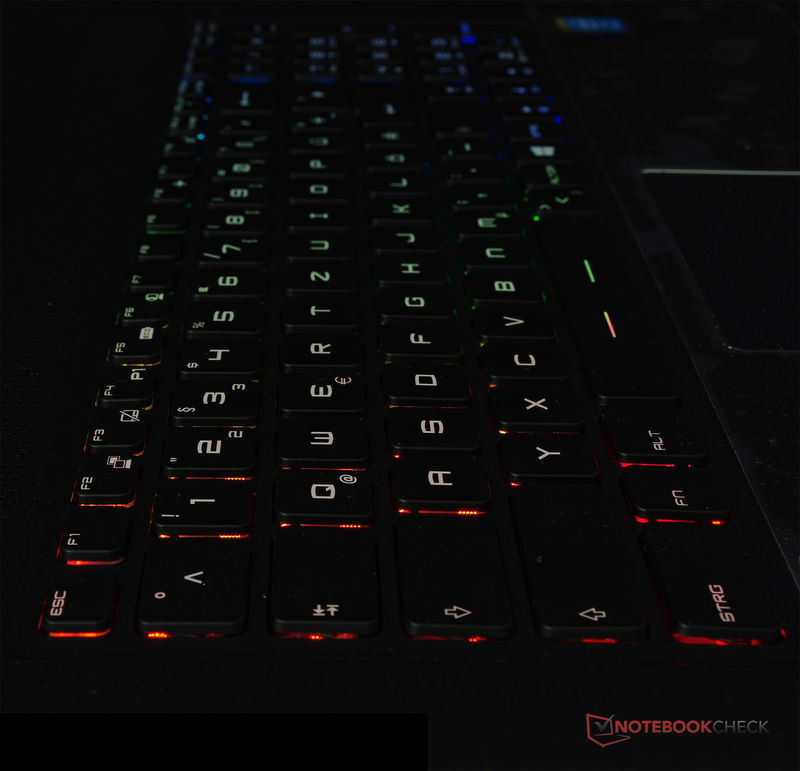 Finally, you get the popular multicolored and configurable keyboard illumination that is similar to Alienware notebooks, which provides individuality. 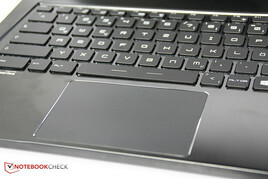 The touch-sensitive surface of the touchpad is rather big with a diagonal size of more than 12 centimeters (~4.7 in). However, there are no dedicated buttons; they are realized by pressing down the whole bottom of the pad on the corresponding side (ClickPad). 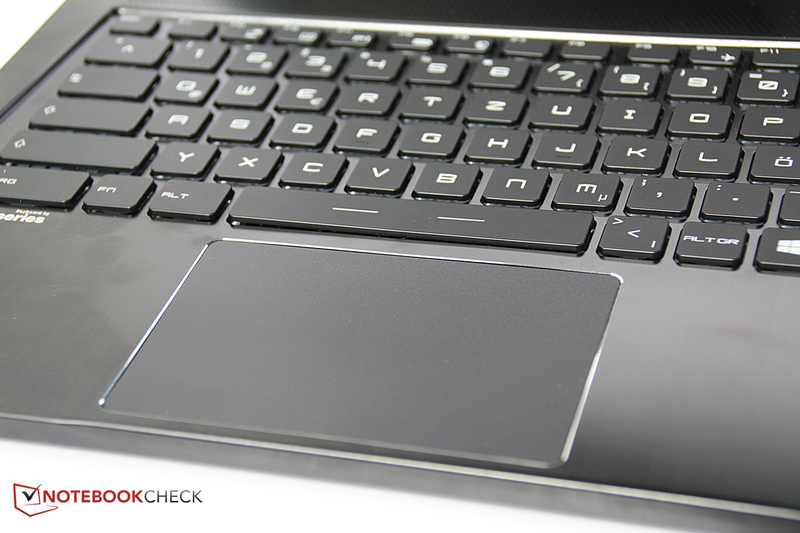 ClickPads are usually not as exact as their counterparts with dedicated buttons are and there are often issues with the recognition of an input from the second finger, which lies on the left button. Fortunately, the MSI GS60 does not have these problems. Multi-touch gestures like zooming or scrolling are supported and work reliably. The surface is not too sticky or too rough, either, but very pleasant. Select the MSI GS60 2PE 3K Edition and you get a display with 3K resolution – as the name already suggests. 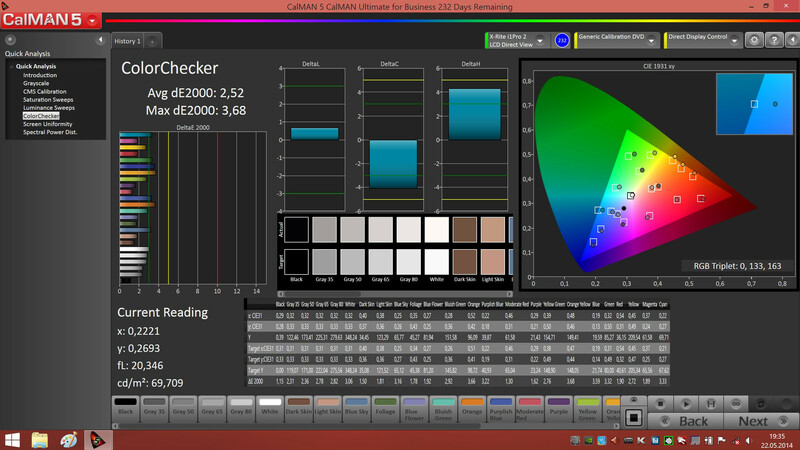 This means that the panel has the native resolution of 2880x1620 pixels. 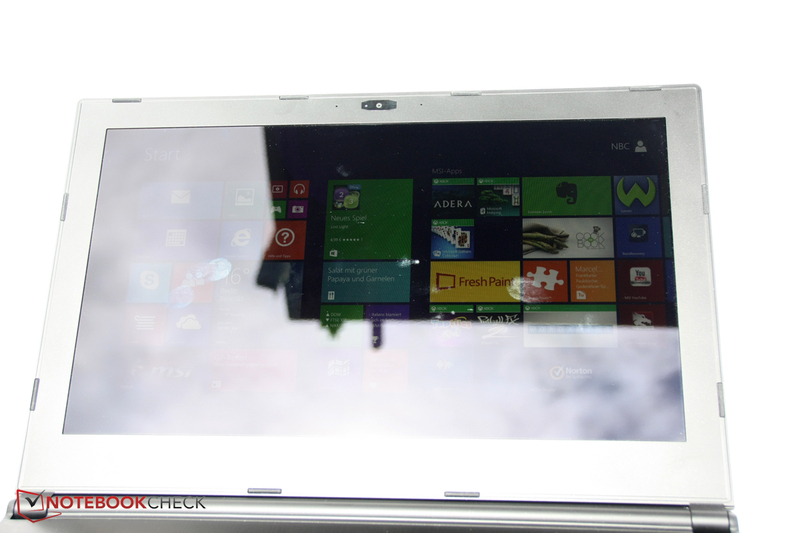 It also has a glossy surface, the Full HD panels in other configurations of the GS60, on the other hand, are matte. 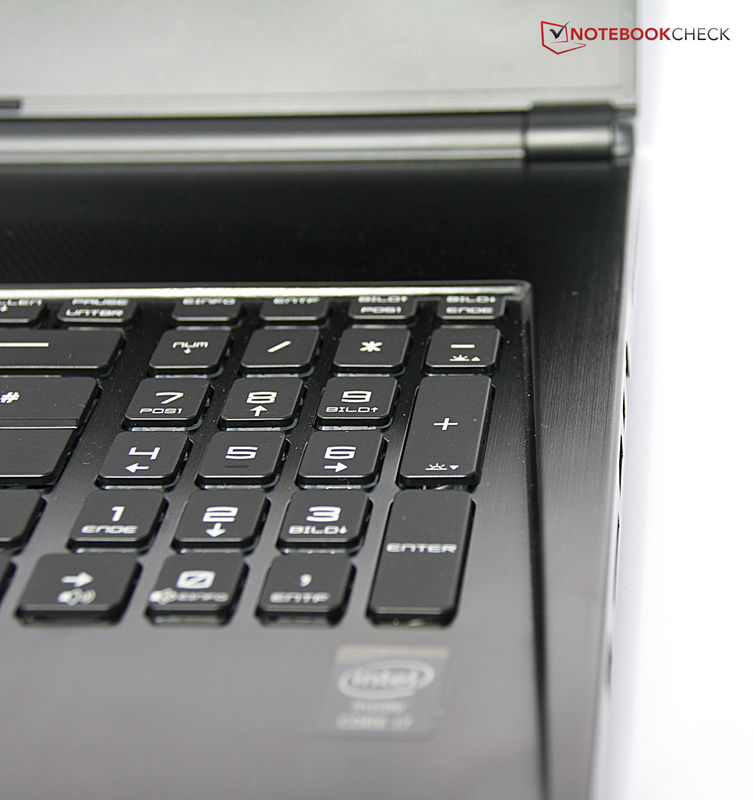 Gaming notebooks usually use matte panels to reduce annoying reflections. However, glossy displays also result in very brilliant colors, and the subjective picture impression of the 3K panel is actually very good right away with rich colors and a detailed presentation. One word about Windows 8: While the Metro surface with its comparatively large tiles benefits from the high resolution and results in a lot of space and overview, it is another situation on the Desktop. Fonts and symbols could be too small for some users, even with the maximum size, and some older applications do not scale well, which can result in tiny windows and very small fonts. 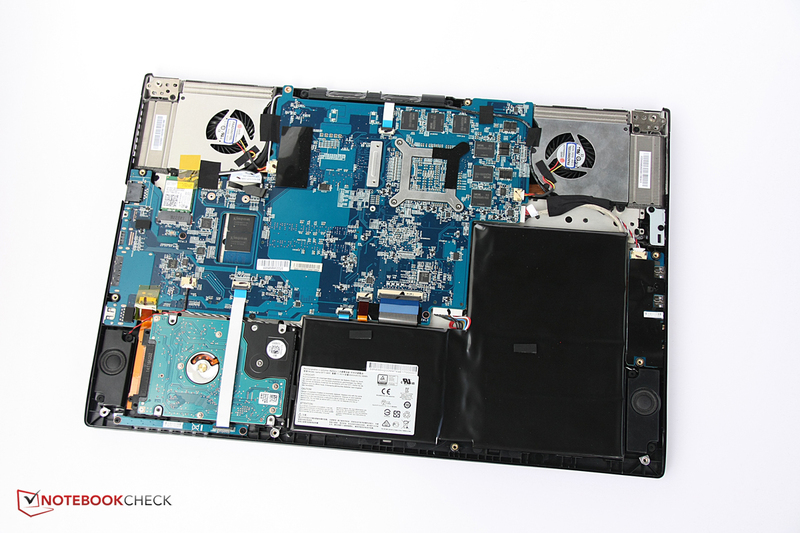 We already mentioned this issue in our review of the MSI GT60. Nice surprise for users who like to use multiple displays at the same time: The HDMI port, the DisplayPort and the internal display can be driven by the graphics card simultaneously. 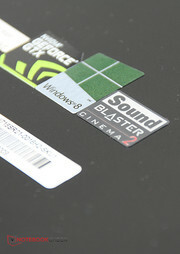 MSI calls this technology Matrix-Display, which is supposed to ensure the maximum overview in games. The average brightness of 309.9 cd/m² at the top is typical for this class and more than sufficient indoors. The brightness distribution is not completely even at 82% and we can actually see brightness differences with the naked eye viewing large white surfaces. The black value is okay at 0.43 cd/m², but not overwhelming. Still, dark areas appear dark, with a slight gray filter at most. The contrast is also decent due to the average black value and the slightly raised brightness. As we mentioned before, colors are brilliant and rich. The display reminds us of the GT60 and it actually uses the same Panasonic panel with the designation VVX16T029D00. 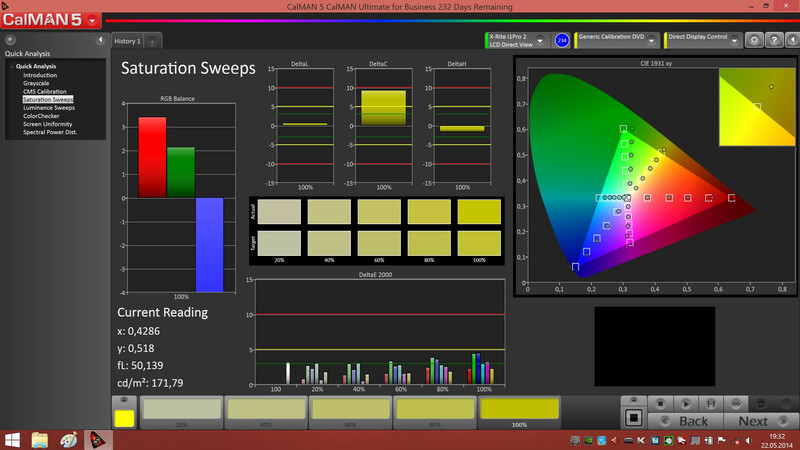 We use a colorimeter and the software CalMAN for a detailed display analysis. 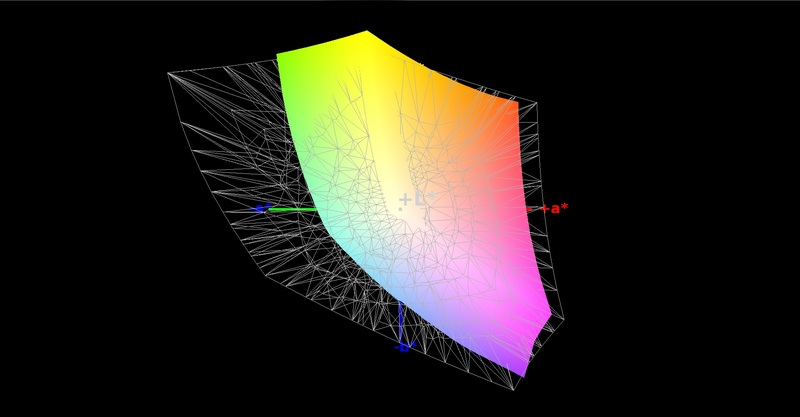 The reference in each case is the sRGB color space for comparison. We measure the values once before and once after the calibration to find out if there is an improvement. 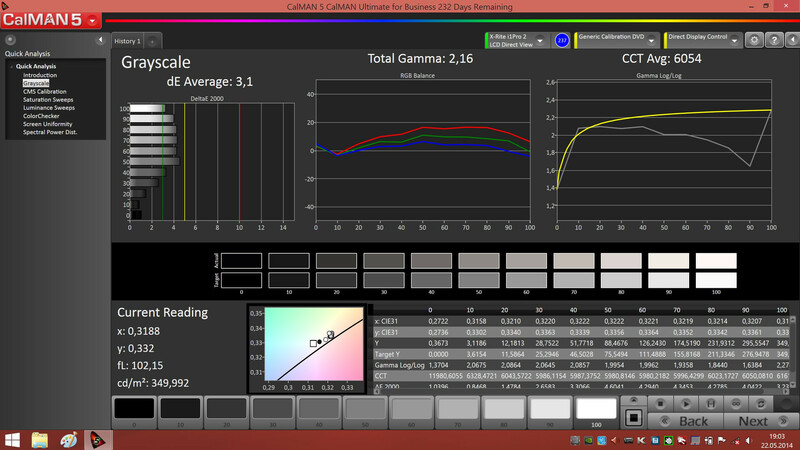 The display already shows a low deviation of the colors from the ideal values before the calibration: We can determine a slight red hue for the grayscale. The deviations of the colors are also far away from the critical area. The oversaturation of red colors is probably supposed to compensate a blue cast, which is typical for many panels, although it might be a bit exaggerated. The automatic calibration reduces the intensity of red colors, and the overall color representation is more exact. 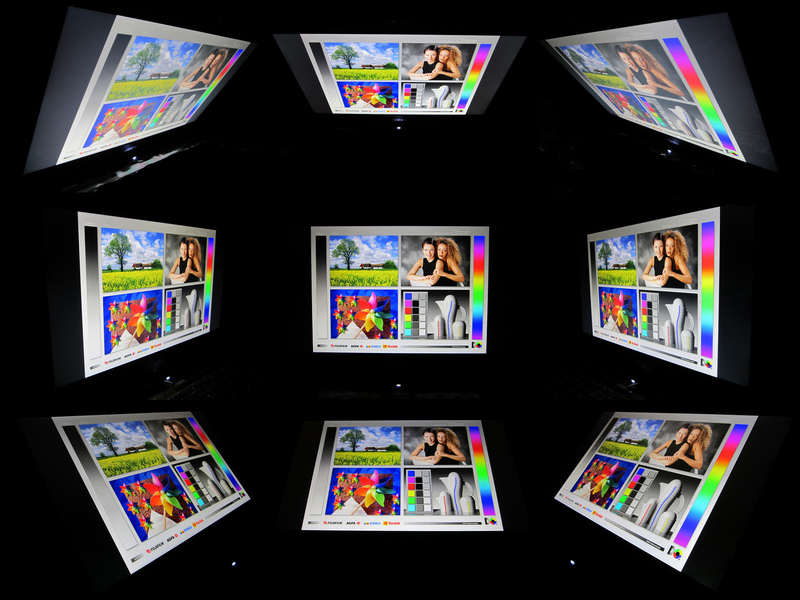 The available color space is not sufficient for professional purposes: The display only covers 79% of the sRGB and 59% of the AdobeRGB color space. 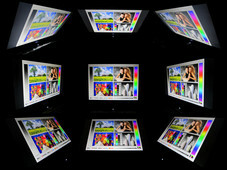 The display creates massive reflections outdoors, and that can also be a problem in bright indoor environments. The brightness is not always sufficient in these scenarios to ensure a good readability of the content. Matte panels definitely have an advantage in this section. The viewing angle stability is convincing; MSI promises 170 degrees on its website, and the IPS technology of the panel actually enables a clearly visible picture from any angle. We can see a slight reduction of the brightness with very flat angles, but that is hardly important in practice. The MSI GS60 2PE Ghost Pro 3K Edition wants to play in the big league despite its slim dimensions. 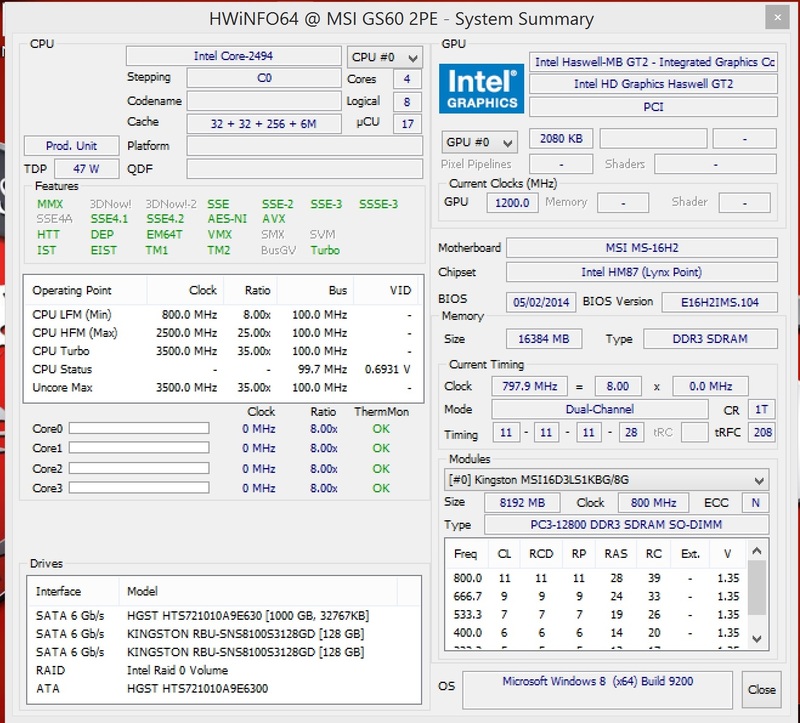 MSI integrates an Intel Core i7-4700HQ with four cores and a nominal clock of 2.4 GHz. 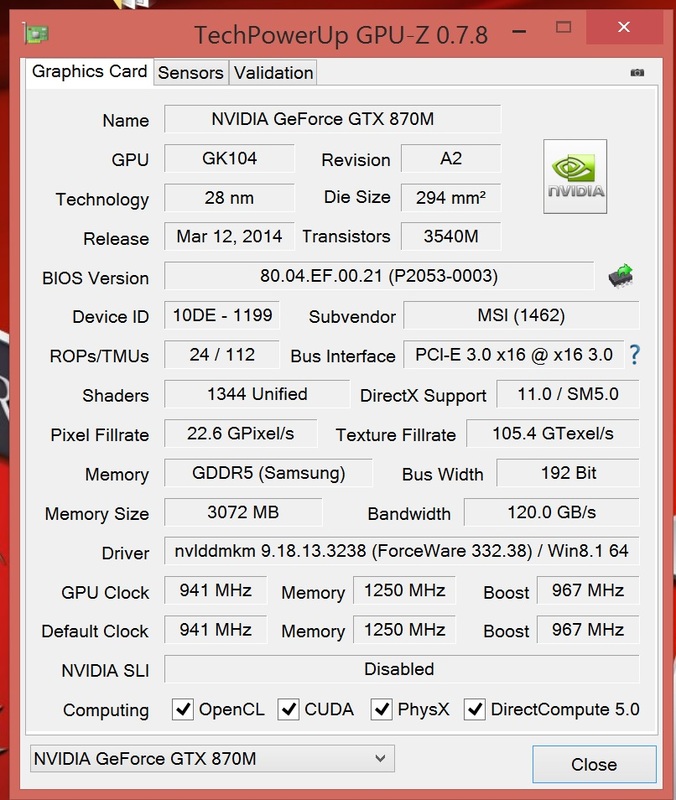 There is also an Nvidia GeForce GTX 870M clocked at 976 MHz with 3 GB dedicated memory. 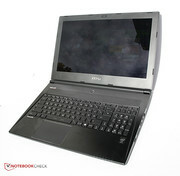 16 GB of RAM are provided by two modules, which is also the maximum memory equipment for the notebook. 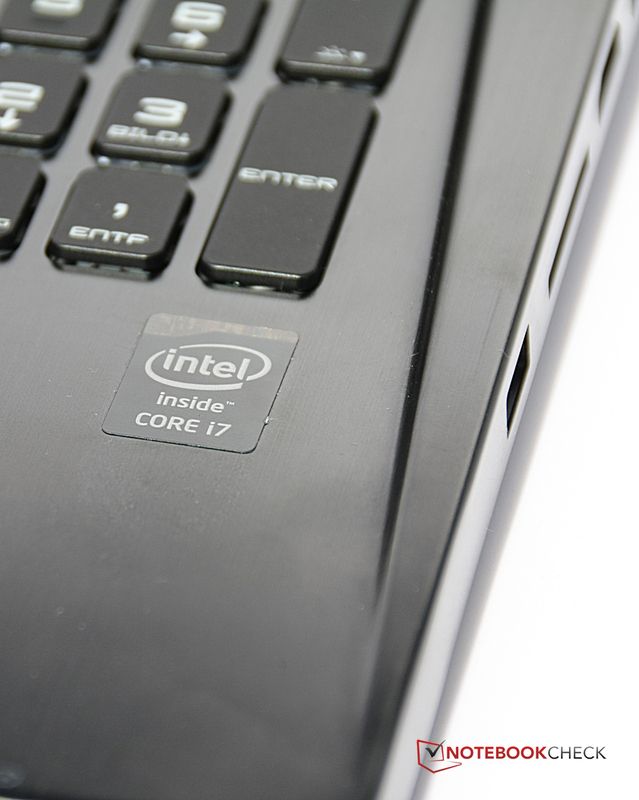 With a Thermal Design Power of 47 Watts, the Intel Core i7-4700HQ can only be used in notebooks with a very powerful cooling solution. 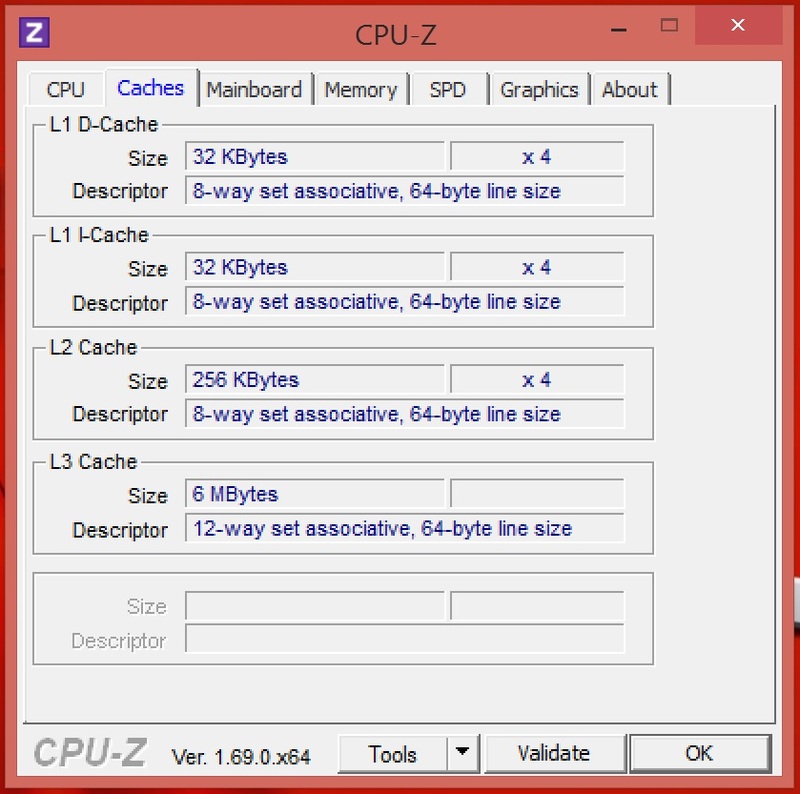 The quad-core processor usually runs at 2.4 GHz, but can be overclocked up to 3.4 GHz via Turbo Boost. 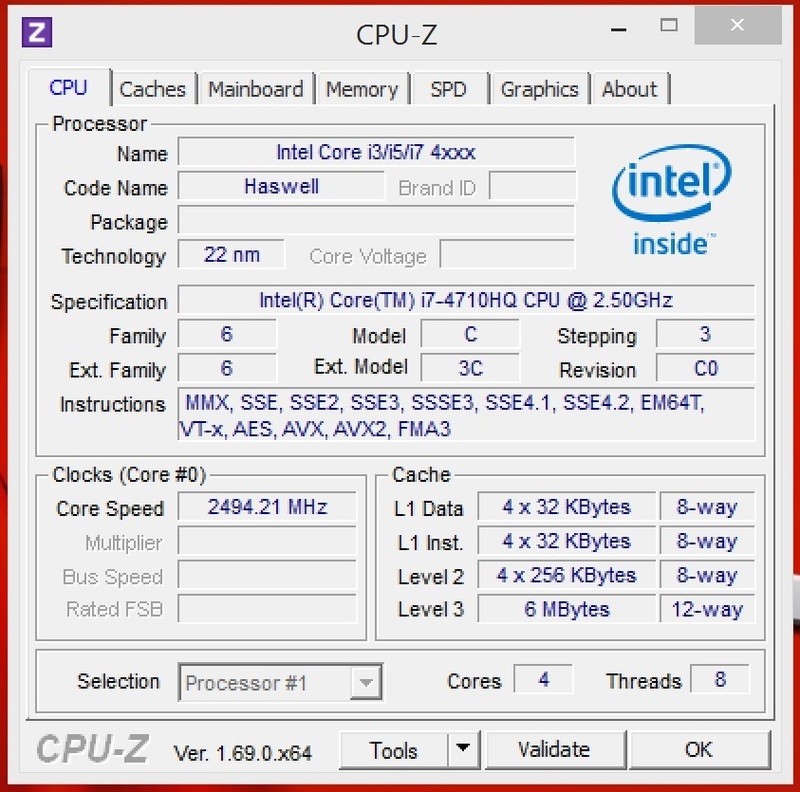 There are some faster processors above the Intel Core i7-4700HQ, but the quad-core should be more than sufficient for most applications. The Intel Core i7-4700HQ is a popular choice for gaming notebooks and is used by many devices within our comparison. 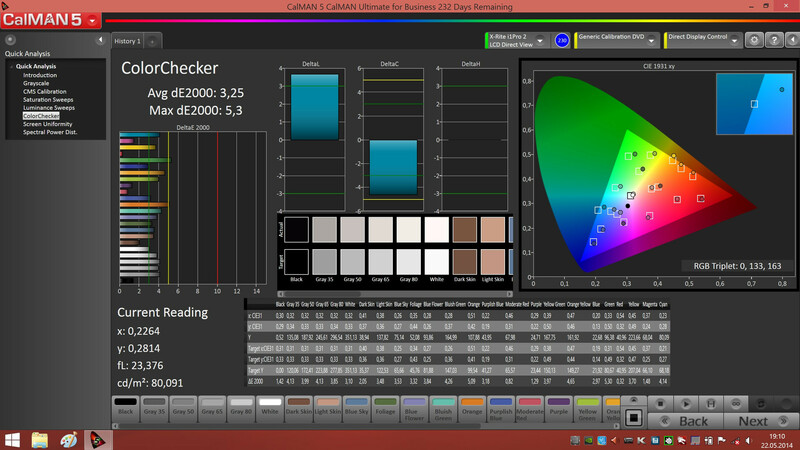 The similar results in Cinebench are therefore not surprising. 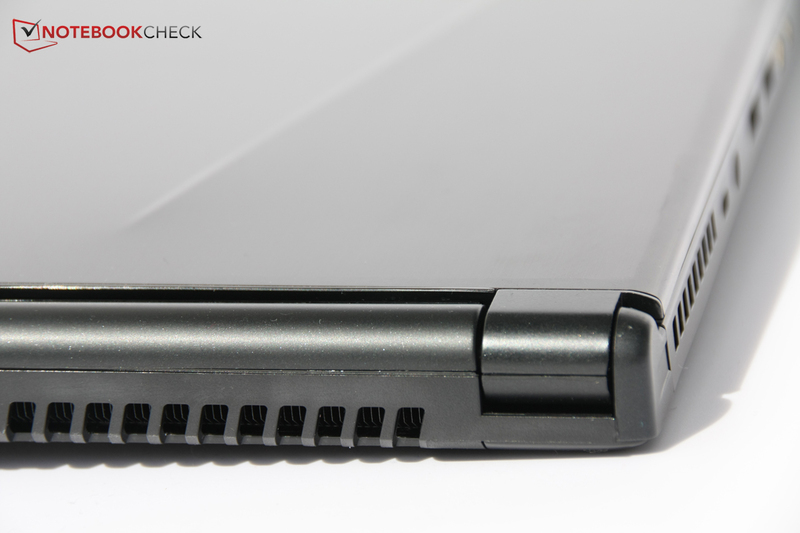 However, it does show that the processor can use its full potential in the MSI GS60. A very fast RAID 0 system with two SSDs (!) also improves the scores of PCMark 7. 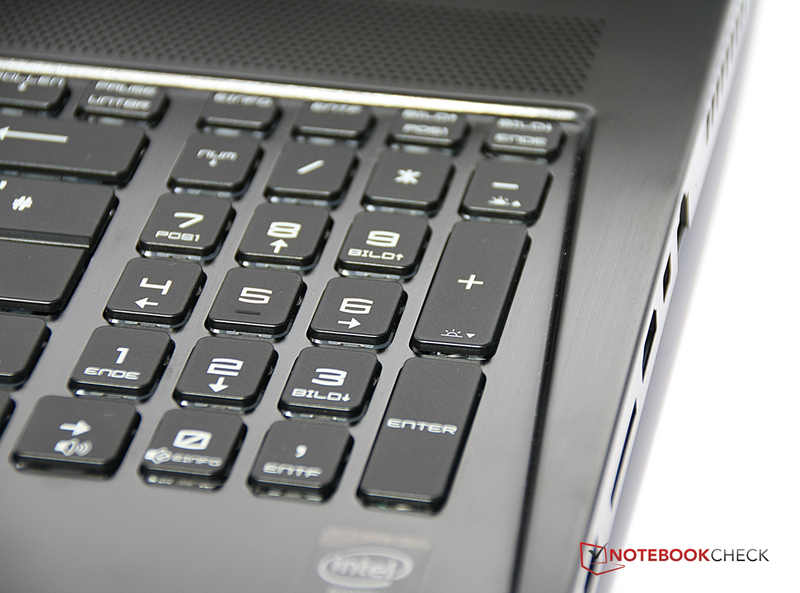 The generous memory of 16 GB could also be a reason for the advantage of the MSI GS60. However, when you consider the PCMark 8 results and look at the overall situation, the MSI GS60 is not ahead of the other devices but rather on the same level. As mentioned before, MSI uses two M.2 SSDs from Kingston with a capacity of 128 GB each in a RAID 0 system. This means files are alternately read from or written on one flash drive, which increases the performance significantly. All notebooks with a single SSD clearly fall behind in terms of reading performance, only the MSI GS70 is even faster with its two Intel SSDs. However, the MSI GS60 cannot keep up with the competition in regard to the write performance, but the reading performance is more important for games. You also get a conventional hard drive with a capacity of 1 TB, which is perfect for a lot of music, pictures, movies or less demanding games. The GeForce GTX 870M is currently one of the fastest graphics cards on the market. The version in the MSI GS60 comes with 3 GB GDDR5 memory and a core clock of 976 MHz. Compared to gaming notebooks with last-gen Nvidia GPUs, for instance, the Alienware 14 and the Razer Blade 14, the GeForce GTX 870M is clearly superior with more than 40% better results in 3DMark 11. 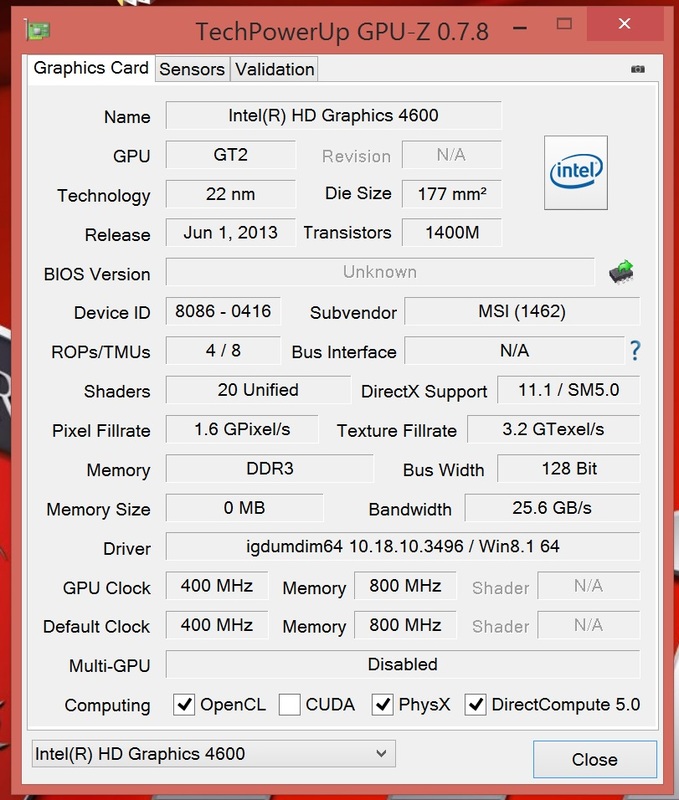 It is roughly on the same level as current devices like the MSI GT60 in terms of GPU performance. We will have a closer look at the real world gaming performance in the next section. We already mentioned that the GeForce GTX 870M is currently one of the fastest mobile GPUs. As a result, it does not have problems with many games, even if you play in Full HD resolution and ultra-high details. However, the performance is not always sufficient for the maximum details in Full HD with the latest games, for example Watch Dogs, which was released a couple of weeks ago, so you have to reduce the settings. The display resolution of 2880x1620 pixels is higher than our ultra settings, so we also tested some titles with this resolution and the maximum settings. The results are in the chart below: You will have to reduce the details in the latest games like Watch Dogs, but older or not as demanding games like Bioshock: Infinite or Anno 2070 can also be played with ultra-high details. Gaming on battery power is obviously possible, but not for a long time, and the performance is limited as well. 3DMark 06 shows how drastic the impact is: The MSI GS60 manages 11,795 points and 4,369 for the CPU with the energy profile maximum performance on battery power. Attach the power cord and you almost get twice the results: 26,471 and 7,211 for the CPU. The performance is also significantly reduced in games, for instance Tomb Raider: The notebook only manages 21.9 frames per second with ultra settings compared to 38 fps with the power adaptor. Cooler Boost is MSI's technology, where two fans dissipate the warm air from the CPU and the GPU separately from each other. This is supposed to keep the temperatures and the resulting system noise low. The fan noise is actually on the level of most other gaming notebooks. Compared to other current gaming notebooks from MSI, the GE60 and the GT60, it is even a bit quieter despite the smaller chassis. The fan speed is increased and decreased almost seamlessly and produces only a restrained noise. The fans are, however, running all the time, even if the GeForce GTX 870M is not active. 32.4 dB(A) is the minimum system noise, other devices are better: Gigabyte P34G or Razer Blade 14 manage less than 30 dB(A). We measured up to 51.4 dB(A) under maximum load, which is an average result within the comparison. 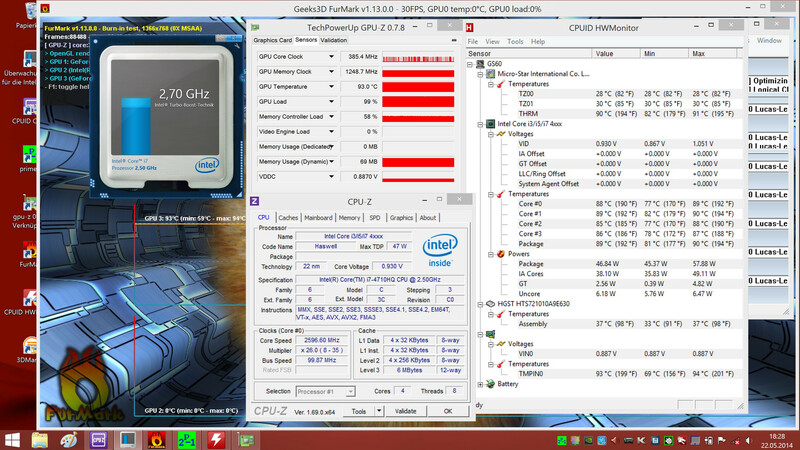 Stress test: GPU clock drops, CPU Turbo cannot be utilized anymore. We promised a hot ride, which can be said about the impressive gaming performance, but also about the case temperatures that can reach dangerous values. There is no problem during idle: Up to 36.5 °C (97.7 °F) at the bottom is perceptible, but still acceptable when you consider the thin chassis and that other devices, for example the Alienware 14, get much warmer. However, we can measure up to 78 °C (172.4 °F) at the bottom under maximum load, and the average temperature at the bottom is 56.7 °C (134.06 °F). These are some of the highest temperatures we ever measured and clearly way too high: 78 °C is hotter than most radiators at the highest setting and can even result in burnings. You should not use the MSI GS60 on your lap under any circumstances! The temperatures at the top are very high as well: Up to 50.5 °C (122.9 °F) is not comfortable to touch. At least the palm rest is the "coolest" area at up to 42.2 °C (107.96 °F) in the center. Still, the temperatures are clearly excessively high and can even be dangerous for the user. We appreciate the highest possible performance in a very small case, but the safety of the user should be the highest priority. 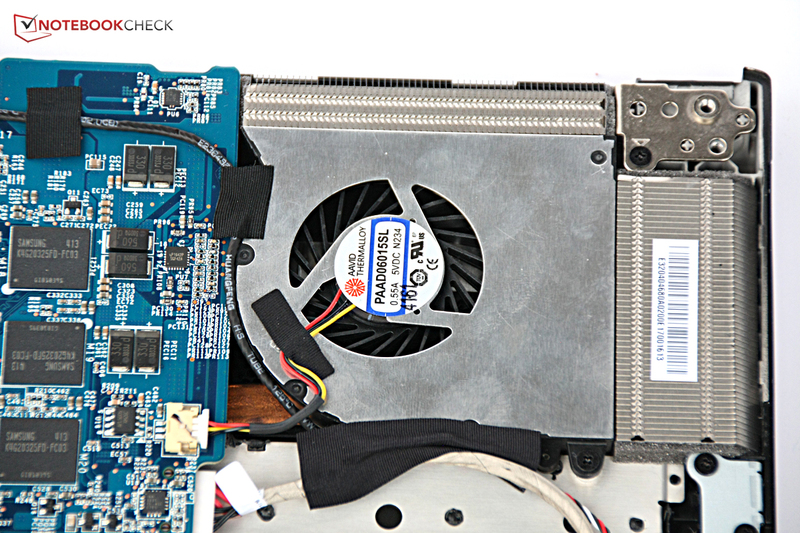 Less dramatic but still annoying: The graphics card quickly reaches temperatures above 90 °C (194 °F), which can result in a drastic reduction of the lifespan. Our stress test also showed that the clock of the GPU is throttled, probably because of the high temperatures. We test the effect with 3DMark 06: We use the benchmark, which is undemanding for modern graphics cards, once immediately after the stress test and once after a cold start before the GPU is stressed. The result is encouraging: The scores are almost identical, so we can assume that the GPU only throttles if there is maximum load for the processor and the graphics card at the same time. The frame rates in games are not behind other laptops with this GPU, either. (-) The maximum temperature on the upper side is 50.5 °C / 123 F, compared to the average of 39.3 °C / 103 F, ranging from 21.6 to 68.8 °C for the class Gaming. (-) The average temperature of the palmrest area of similar devices was 28.7 °C / 83.7 F (-13.5 °C / -24.3 F). The good speakers were developed in combination with Dynaudio. 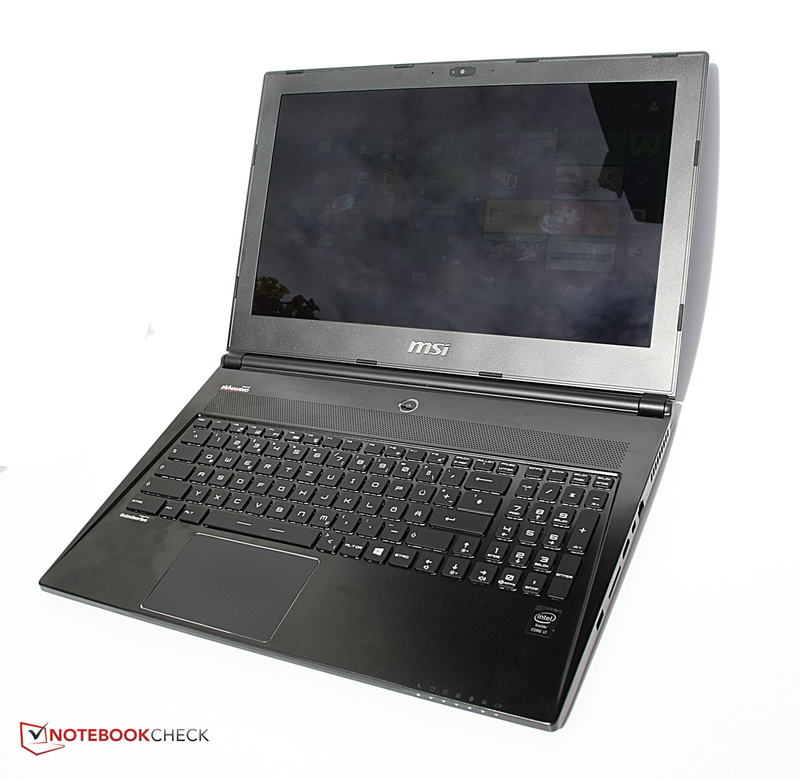 We often praised the notebook sound systems in MSI gaming notebooks, and the same applies for the GS60 2PE Ghost Pro 3K Edition. One explanation for the good sound might be the integration of two speakers and two subwoofers at the bottom of the case. For comparison: The current Alienware 17 does not even have a subwoofer. Another important factor for the good sound is the software Sound Blaster Cinema 2 with numerous adjustable settings for an individual sound characteristic. You can also deactivate the subwoofer, which shows that the sound is much tinnier without it. So the sound is good, but the maximum volume could be a bit higher. Medium, high and low tones are well balanced and music as well as movie playback and game sound are very precise. MSI reduced the audio ports compared to the GS70: The third stereo jack for a 7.1 system was waived, but the sound via external speakers or headphones is very good nonetheless. A lot of performance obviously requires a lot of power. MSI equips the GS60 2PE Ghost Pro 3K Edition with a 150-Watt power adaptor, which is supposed to provide sufficient power under maximum load. Thanks to Nvidia Optimus and Intel's energy-saving features, even gaming notebooks with powerful dedicated GPUs and fast processors have a comparatively low consumption during light workloads. 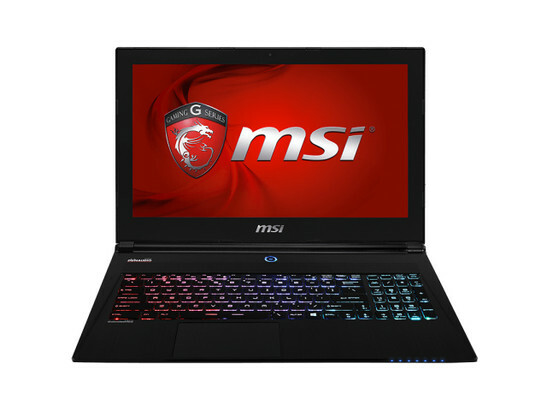 The MSI GS60 2PE Ghost Pro 3K Edition uses at least 10.5 Watts when idle, which is slightly above the MSI GS70 or the GE60. The GT60 on the other hand, consumes at least 15 Watts when idle. MSI points out that the 3K display consumes more power than the Full HD displays in the other configurations of the GS60, which also results in a higher overall consumption. We could not verify this statement, but the GS60 uses slightly less energy than comparable gaming laptops, even with the 3K display. This is supported by our stress test with maximum load as well: Our review unit consumes up to 168.5 Watts, the GT60 consumes significantly more and 14-inch devices like the Razer Blade and Gigabyte P34G are much more frugal. However, this consumption is a problem because the power adaptor only has a nominal output of 150 Watts. This is probably also the reason for the high temperatures of the PSU under load and that the battery is drained under maximum load, even with the attached power adaptor. You can decide for yourself if this is a feature to enable a smaller and lighter power adaptor and still use the full performance, or more of a concession. 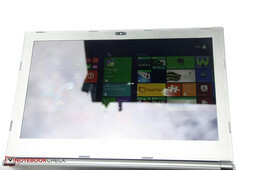 The battery capacity is a bit smaller compared to a full-size gaming notebook because of the limited space: 52 Wh are provided by the lithium-polymer battery. For comparison: The MSI GT60 has a battery with 87 Wh and also limits the GPU performance significantly on battery power. The battery of the Razer Blade is larger as well with 71 Wh. A game like Tomb Raider can be played for around 50 minutes with high settings on the MSI GS60 if there is no socket nearby. However, the performance is clearly limited on battery power as we mentioned in the section Gaming Performance. A movie with an extended runtime can be watched on battery, but it was not quite enough for the Extended Edition of "The Lord of the Rings: The Fellowship of the Ring" at 2:43 hours. Web browsing via WLAN is possible for 3:13 hours. 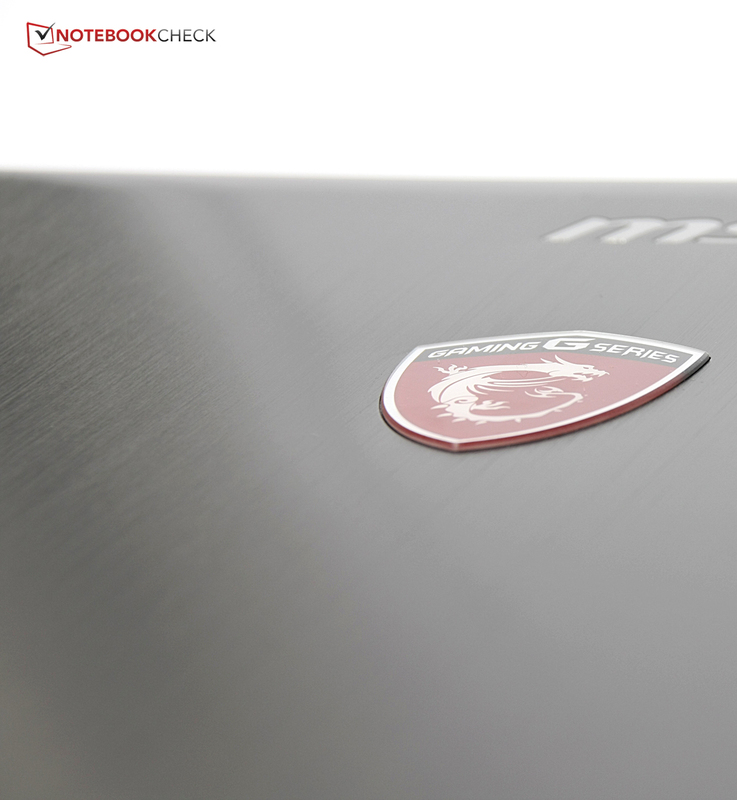 Overall, the runtimes of the MSI GS60 are on the same level as most gaming notebooks within the comparison. The Razer Blade manages around half an hour more for web browsing and movie playback. An extreme amount of performance and a very high-resolution display in a very thin chassis. Wow, does the perfect device really exist? MSI almost managed to fulfill gamers’ dreams for an ultra-mobile yet very powerful notebook without compromises – but just almost. Let's start with the impressive design of the MSI GS60: The very high-quality chassis is just as convincing as the thin silhouette and the low weight are impressive. The gaming and the application performance are on a very high level as well: Less demanding games run smoothly with the maximum settings, even with the native 3K resolution of the display. You also get speakers with very good sound, numerous adjustments for the keyboard layout and illumination as well as the limited but at least available maintainability. We also like the decent input devices, even though they are not perfect. System noise, energy consumption and battery runtimes are also okay. Now comes the big BUT: The device gets warm while idling, hot during gaming and you might be burned when you touch the bottom after a long period of maximum load. This is not acceptable, especially since the graphics cards reach temperatures that can affect the lifespan. These problems result in big point deductions because you cannot use the notebook on your lap, which does affect the mobility. If you are just looking for a very mobile gaming laptop and just want to use it on a table or a solid (not heat-sensitive) pad, this might not be a deal-breaker. If it is, you might want to look at other configurations of the GS60 with a less powerful but still pretty fast GeForce GTX 860M. This configuration might stay cooler, but we would have to test that in a separate review. A matte Full HD panel is also available; the GS60 is not recommendable for current games with higher resolutions and maximum details anyway. The GS60 2PE Ghost Pro 3K Edition is therefore a device that can be impressive and convinces us in many areas. The extreme heat development is, however, a serious problem that you should consider before you pay almost 2,000 Euros (~2707). 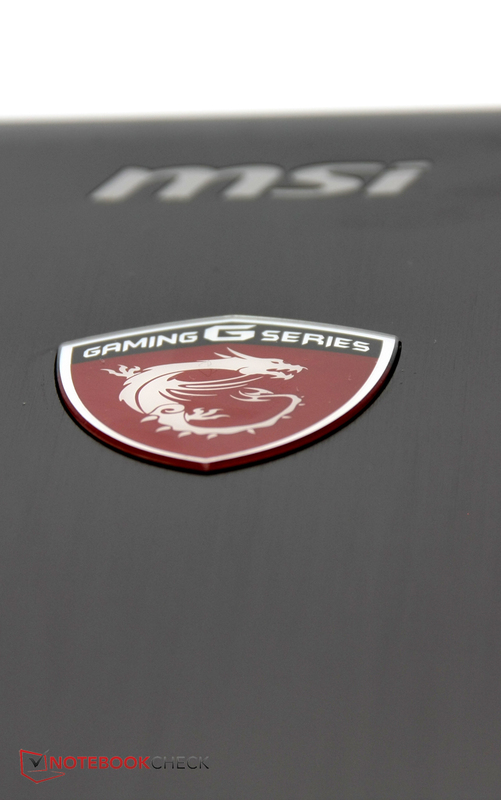 In Review: MSI GS60. Review unit courtesy of MSI Germany. 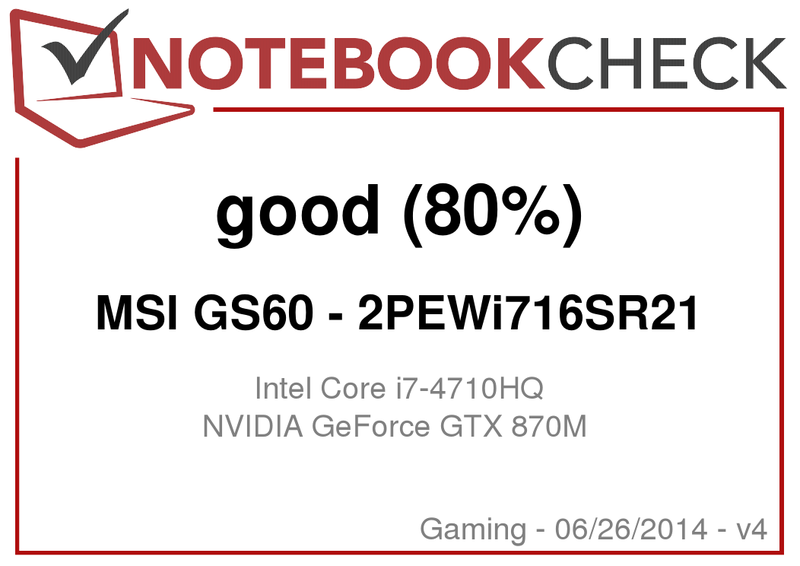 In Review: MSI GS60 2PE Ghost Pro 3K Edition. 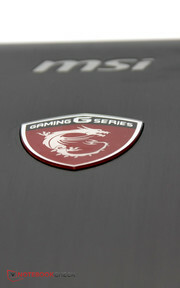 Review unit courtesy of MSI Germany. 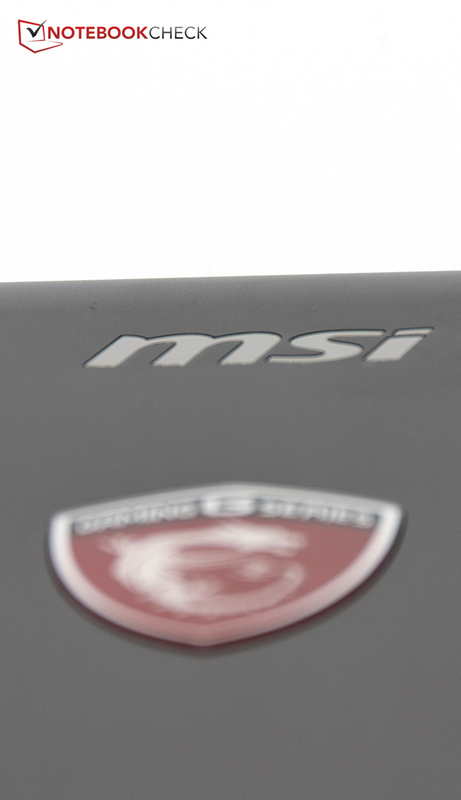 The MSI GS60 wants to be thin and offer full gaming performance at the same time. The case is pretty appealing and comparatively thin. 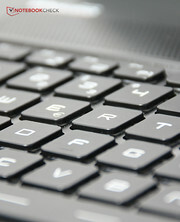 Nice diagonal edges surround the keyboard. The materials leave a high-quality impression and are well-built. The stability does not reveal any serious issues, either. ...and are easy to open at the same time. The back accommodates large fan exhausts – a lot of performance also creates a lot of heat. Support feet are supposed to create some breathing room for the fans. 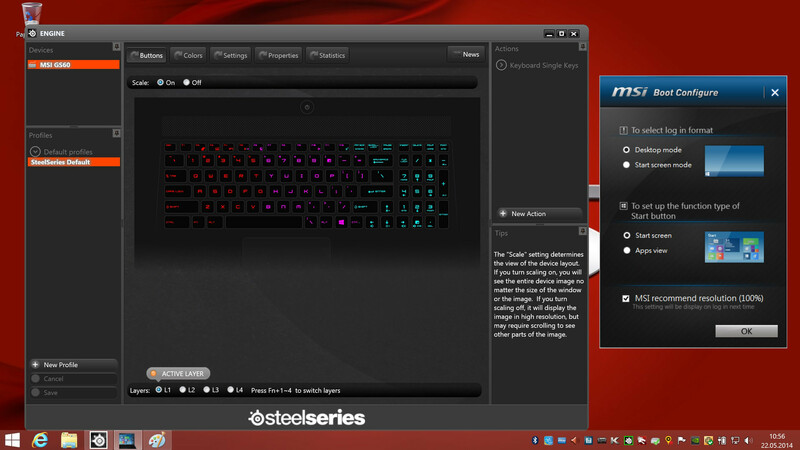 The keyboard was developed with SteelSeries. ...just like an illumination that can be adjusted in multiple zones and several colors. The power button is also illuminated. The lettering looks pretty futuristic, but is easy to read. The layout on the other hand requires some time getting used to it. All in all we like the keyboard because of the soft stroke and the high precision. 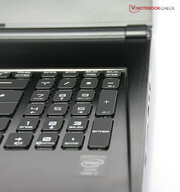 The touchpad has integrated buttons, but is precise and reliable. 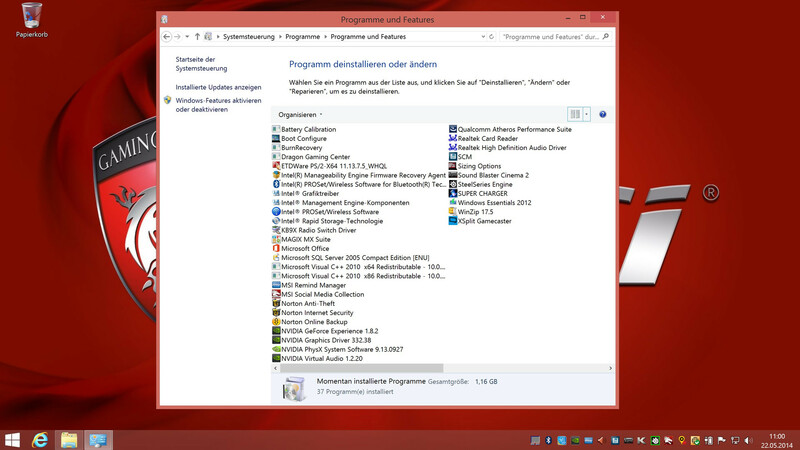 Windows 8.1 is preinstalled. The Metro-UI benefits from the high resolution. The GPU is very powerful but creates a lot of heat in return. 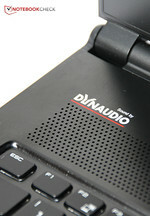 The speakers were developed by Dynaudio and convince with a good and rich sound. They are supported by two subwoofers at the bottom of the case. The display has a good color presentation, but is not suited for outdoors because of the glossy panel. Remove the bottom and you can maintain some components, despite the thin construction. You can, for instance, replace the hard drive. 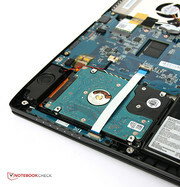 You get access to the battery as well, but it is not easy to remove it compared to other notebooks. ...cool the CPU and the GPU. They can easily be cleaned. You will have to remove some applications if you don't like bloat ware. Keyboard and Windows 8 can be adjusted with additional applications from MSI. Neither the CPU nor the GPU reach their maximum performance in our stress test. Overall, MSI created a great package. The only drawback is the dangerously high temperatures. We were impressed by the high performance in the thin case, the great input devices as well as the sound from the speakers. Overall we would prefer a matte display. But that's no problem: MSI offers them as well. That a notebook can get this hot – ouch!